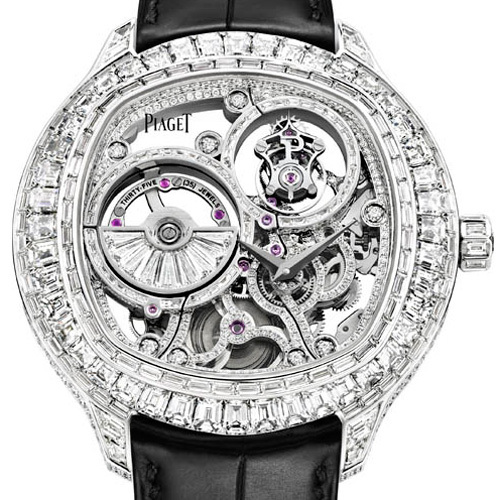 Showcasing its skills at the very pinnacle of the watchmaking and jewellery arts, Piaget offers a unique interpretation of these twin fields of expertise with its Emperador Coussin Tourbillon diamond-set automatic skeleton exceptional piece. Defying the laws of technical feasibility, the Manufacture introduces the only baguette-set skeleton movement on the watch market, appearing in addition within an ultra-thin composition also featuring a flying tourbillon. Pushing the boundaries of audacity, Piaget has gone so far as to set both sides of each of the functional elements of the ultra-thin automatic tourbillon 1270D movement beating at the heart of this Exceptional Piece. An exclusive work of art featuring equally exceptional finishes achieved by patient hand filing and masterful polishing. The artisan of a time that it has been perpetually reinterpreting in talented and inventive ways since 1874, the Maison Piaget has written some of the finest chapters in Swiss watchmaking history. In the early 1960s, endowed already including a number of iconic models, it acquired lasting legendary status by establishing itself both as the master of ultra-thin horology in the domain of Fine Watchmaking, and as the alchemist of the finest precious stones in that of High Jewellery. Thanks to these twin competencies entirely mastered within its two Manufactures – one in La Côte-aux-Fées for the movements and another in Plan-les-Ouates for crafting jewellery and watch cases – Piaget is able to give free rein to its creative audacity in creating mechanical treasures woven from gold and diamonds that represent as many landmarks in the world of precious Fine Watchmaking. 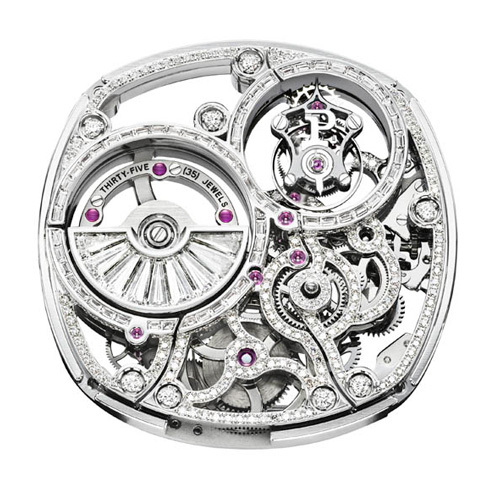 In 2005, Piaget caused a sensation by presenting its Calibre 600D, the first gem-set skeleton movement ever made. Moreover, the extent of the accomplishment went even further, since this exceptional mechanism is equipped with a flying tourbillon, one of the most demanding horological complications, and set a new slimness record in its category at just 3.5 mm thin. This shaped calibre was followed by other skeleton gem-set round movements, in these instances without complications, such as the 838D and the 1200D – also featuring record-breaking slenderness in their segment at respectively 3.1 mm and 3.0 mm thin. Whereas Piaget remains the only watch Manufacture capable of gem-setting the functional elements of an ultra-thin skeleton calibre, it now presents a further breakthrough in this demanding art. Displaying stunning technical mastery, it takes boldness to a whole new level by presenting a unique baguette-set skeleton movement: Calibre 1270D beating at the heart of the Emperador Coussin Tourbillon Automatic diamond-set automatic skeleton exceptional piece. Dazzling baguette-cut diamonds form a figure 8 around the rings embracing the flying tourbillon carriage and the oscillating weight. To create this harmoniously undulating line, the supremely skilled artisans at Piaget had to delicately adjust and recut the stones one by one so as to achieve an impeccably smooth overall effect. While the diamond-set movement is crafted in 14K gold, the oscillating weight – also entirely paved but with baguette-cut diamonds only – is made of platinum to enhance its winding properties. This choice made gem-setting an even more delicate procedure due to the properties of the precious metal that is much softer than gold and thus all the harder to work with. 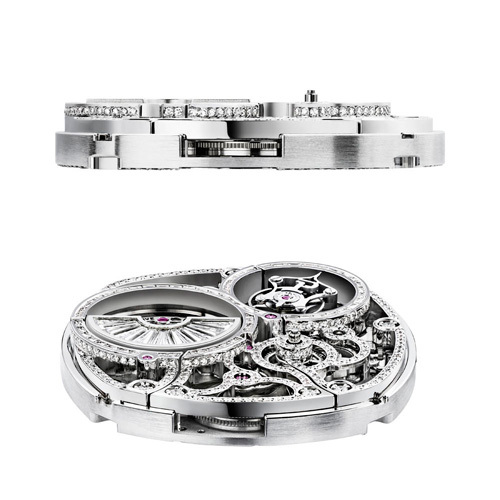 Calibre 1270D thus epitomises a wealth of challenges and represents another first in the Piaget world, since it is entirely set on both the bridge side and the mainplate side. The 71 baguette-cut diamonds (totalling approx. 1.1 carats) are accompanied by 561 round diamonds (1.8 carats) set on either side of the functional elements, therefore creating a truly unique work of art showcasing three different gem-setting techniques: rail setting for the baguette-cut diamonds, grain setting and “pushed-grain” setting for the round diamonds. In an unprecedented demonstration of virtuosity, Piaget has gone so far as to set the sides of the bridges – a daunting task, in that the surfaces involved are so tiny that they can only be prepared and set by the most experienced artisans of their generation using the “pushed-grain” technique. Once again rolling back the boundaries of audacity, Piaget has even gem-set certain screws of Calibre 1270D – another amazing feat when one considers that the shape of these screws had to be specially designed to house a diamond while preserving optimal tightening torque. The master gem-setters of the Manufacture Piaget are at the very peak of their art and thus well-prepared to take up the challenge of entirely gem-setting a 14K gold skeleton movement measuring just 6 mm thin – an eminently lengthy and complex process involving 47 hours of setting for each individual calibre. In the course of this patient labour, they had to keep a close watch on their every move so as to minimise distortion of the matter and to preserve the functional properties of each component. 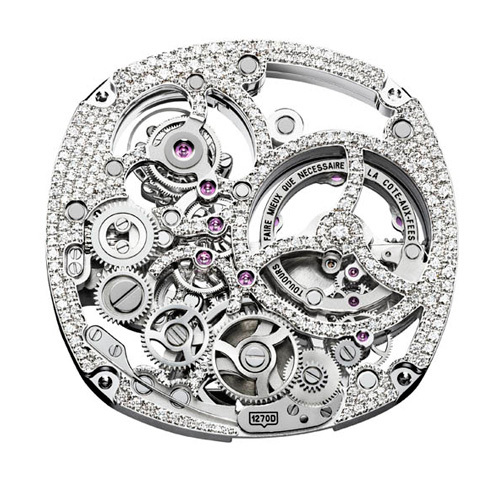 In keeping with its motto “Always do better than necessary”, Piaget reveals the fascinating radiance of this exceptional mechanism, in perfect harmony with the brilliance of the diamonds, through the ultimate degree of finishing devoted to the various parts. These prestigious entirely hand-crafted finishes include a mainplate and bridges that are gem-set, polished and hand-bevelled with a file; a gem-set and polished oscillating weight; sunburst or mirror-polished wheels hand-bevelled with a file; blind-hole and mirror-polished pillar screws; a mirror-polished barrel hand-bevelled with a file; as well as tourbillon carriage bridges hand-bevelled and hand-drawn with a file. Bearing eloquent testimony to the truly unique nature of Calibre 1270, these outstanding finishes highlight such complex techniques as hand-bevelling with a file and mirror-polishing. The latter represents one of the most demanding expressions of the watchmaking art, since it involves polishing the parts with a circular movement so as to achieve a perfectly smooth surface free of the slightest protrusions in such a way that this entirely unmarked surface reflects a deep black colour. A work of true patience and dexterity that tolerates no mistakes, since even the slightest wrong move could prove fatal by scratching the surface of the component. Fiercely devoted to its tradition of designing and crafting complicated movements that form a seamless whole with their case, Piaget has drawn upon the combined skills of its twin Manufactures to develop the most exclusive calibre it has ever produced. No less than three years were required to reach such a degree of perfection. Three years during which the master-watchmakers of La Côte-aux-Fées worked in close collaboration with the case developers and gem-setters to create the unique baguette-set tourbillon automatic skeleton movement – appearing in addition within an ultra-thin 6 mm cushion-shaped composition. To achieve this, Piaget drew inspiration from its iconic automatic Calibre 1270P tourbillon movement, which it recreated in 14K gold before hollowing it to create a skeleton-type structure – all the while anticipating the numerous constraints involved in gem-setting the functional parts. The sophistication of this unique exercise in the domain of Fine Watchmaking was compounded by the difficulty of reproducing the reversed construction of the original Calibre 1270P so as to remain loyal to its signature characteristics. 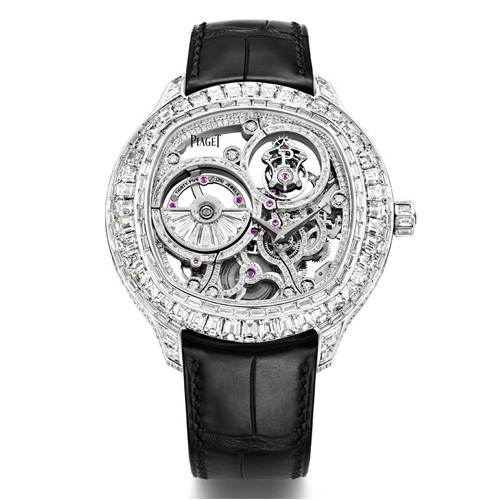 The oscillating weight set with baguette-cut diamonds and the bridges are thus visible on the display side, while the tourbillon and the hour and minute indication opt for off-centred positions. As if suspended in thin air, the flying tourbillon bearing the P for Piaget spins airily at 2 o’clock, weighing a mere 0.2 grams despite its 42 components including three titanium bridges. Meanwhile, the mainplate entirely set with round diamonds reveals its radiantly seductive elegance through the sapphire case-back. Gracefully following the contours of the 1270D movement beating at the heart of this fascinating mechanical orchestration, the contemporary lines of the white gold case are lit up by an enchanting cloak of diamonds individually calibrated to respect the unique aesthetic of the Emperador Coussin. Highlighting the exclusive character of the movement, the case itself is a masterpiece of gem-setting calling for 136 hours for a single watch. No less than 794 diamonds (15.2 carats) featuring an appealing variety of baguette, round and emerald cuts – work their magic on the bezel, case profile, lugs and crown, while 24 baguette-cut diamonds (1.7 carats) adorn the clasp of the strap. The incomparably exclusive Emperador Coussin Tourbillon diamond-set automatic skeleton exceptional piece is decked out in a total of 1,450 diamonds totalling 19.8 carats between the mechanism and the exterior. Its fascinating beauty and radiance make it the most powerful imaginable embodiment of Piaget’s cherished commitment to precious Fine Watchmaking.